Finding a job online isn’t totally a new concept but it is evolving and getting redefined with times. Today, when job portals are at boom, I want to introduce you to a vCard service called Switch Idea. It not only provides you to create unique and professional identity on web but also helps you get recruited automagically. Switch Idea is based on a simple and innovative concept of social media recruiting. Job seeker signs up and complete his profile (also called as “vCard“) giving detailed information about his professional skills and career objective. Whenever there is a job opportunity posted by an employer, you will get notified on your social accounts (i.e. Facebook, Twitter, LinkedIn or Google+) if it is for you. That’s it! You no more need to invest time and money to conduct recruitment drive. All you can use is a power of Social media recruitment tools like Switch Idea. Signup as an Employer and post a job according to your requirement. Eligible Job seekers will be notified on their Social Accounts (i.e. Facebook, Twitter, LinkedIn or Google+) and they will apply if interested. While filling up your profile, site asks you to connect your social media (Facebook, Twitter, Google+ or LinkedIn) accounts. Resume has a field which asks for keywords which tells about career interest. When an employer posts a job, he also specifies certain keywords which tells about job-type. People in the community with matching keywords will get notified automatically via Email and social Networks. This is the uttermost important feature of this service which lets you create professional virtual card in few clicks. vCard consists of Personal information, Resume and contact form. This is a public URL and can be used to display it for other purposes not related to Switch Idea. It is your online CV flaunting your personal info and skills in an elegant way. There are other services to create Résumé online but Switch Idea makes things absolutely simple. Each profile gets a unique PIN which can be used sitewide for any contact purposes. 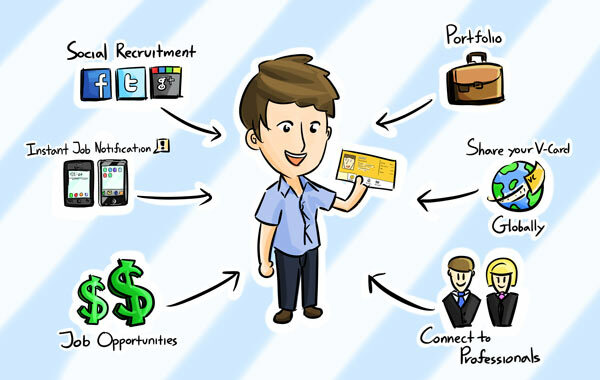 Overall, it is a concept to uplift social media recruitment and make job seekers meet the right employee with an ease. Do you still need convincing? Join now till it is FREE! Sir, can you tell me how I get a good and reliable online job? I have sufficient typing speed. So I can do data entry job. I am a govt. job seekers. So I can not spend many times to any part time job in out side . But I need money too. If I get any home base job then I can concentrate on my study and make some money from my rest time. I have small budget to invest So, if you help me about that, I will be very grateful to you. First of all you got these skills (as mentioned above) and there might be many people/small companies who might be looking for people like you. But the problem is they don’t know you neither they know your contact details. That’s the reason Switch Idea is for. Last step: Go to Skills Menu and fill in your skills. Once you do the above things, share your vCard with everyone, so that people will come to know more about you and your skill(s). This will not only give you job opportunities but also give you an online identity ! !